When members of the Formentera Council congregated today for an extraordinary plenary session, the motions they opted to support included a contract to build the island's assisted living residence as well as a call for bids ahead of upgrades on a Sant Ferran road. Assembly members voted unanimously to adopt a measure from the senior cabinet to award a works contract for a live-in dependent care centre. Infrastructure secretary Rafael González, who called the facility “fundamental for Formentera and islanders”, added it was “the crowning piece, along with the funeral home currently under construction, of the island's network of public health facilities”. González boasted the completed project would mean “a decent service with which to care for our elders”, and said it represented “more than just a quality of life improvement” but that “birth, life and death on Formentera” would at long last be possible. Work on the nearly two-million euro buildout, which spans 1,169.17 square metres, will start this winter and has an estimated 16-month timeline. The project, essentially an expansion of the island's dependent care centre (known as the Centre de Dia), will create 14 additional single and two new double rooms, supporting a total of 18 people. The new structure will house a reception area, visitor services, a dining hall, living room and areas for nursing staff, medical exams and storage. The Balearic Islands' social welfare ministry will cover 70% of costs while the Formentera Council will put up the remaining 30% in addition to the land on which construction takes place. 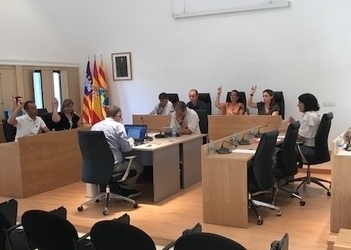 With support from Gent per Formentera representatives and abstention from PP, PSOE and Compromís party members, the day's gathering also brought approval for a motion to put to tender upgrades on Sant Ferran's avinguda Joan Castelló i Guasch. The administration is also calling for bids to manage the reforms and oversee the project's progress. “We'd like these upgrades to act as a coil-spring for the town of Sant Ferran. To make it a pleasant place to live and an easy one to get around on foot”, explained the infrastructure chief. González pointed to another aspiration as well: Revitalising local commerce. He noted the upgrades would “fulfil the same criteria” as last winter's work on carrers Guillem de Montgrí and València. At that time, crews “took out architectural barriers, widened the pavements and implemented metred parking”. The current upgrades, he said, will mark a continuation of the previous project and “put the same benefits within reach of the other townspeople”. The reforms project on the avinguda (“avenue”) known as Joan Castelló i Guasch covers a range of pavement surface improvements, the undergrounding of services like sanitation, drinking water, telephone, electricity and street lights. The proposal also covers expansion of pedestrian spaces and would mean eliminating architectural barriers and incorporating a dedicated bike lane along the entire road. Recharge points along the road are envisioned as well. Engineers of the project, a continuation of the improvements on carrers Guillem de Montgrí and València, are hoping for the same “single surface fix” (i.e. uniform levelling of the pavement and road surface heights) as the one used for the earlier revamp. The six-month deadline is intended to ensure completion in time for the 2019 tourist season. The €1,858,000 price tag includes execution and management of the works. In the first half of October, the Council will convene a gathering of Sant Ferran residents in order to detail the proposed changes, similar to the process that preceded upgrades on carrers Guillem de Montgrí and València.